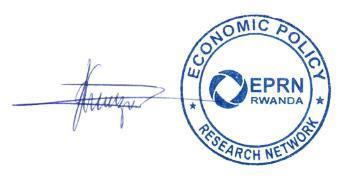 The Economic Policy Research Network (EPRN Rwanda) is a Membership-based Organization with the mission to strengthen national capacities for evidence based economic policy development through research, training and provision of networking opportunities for interested professionals and institutions. EPRN places a special focus on the research potentials held by University students who are the nurseries for economic researchers and crucial players in shaping Rwanda’s future, which is why they should have access to economic policy research networks such as EPRN. EPRN wishes to recruit a motivated professional intern to successfully coordinate the members from their places (field assignment). Interested candidates are requested to submit the Application Letter and CVs at EPRN office located at UR-CBE Gikondo (ex SFB) by not later than 11/02/2019, 5pm local time. Applications may also be sent through EPRN P.O. Box : 7375 Kigali-Rwanda until 11/02/2019, 1pm OR emailed to : info@eprnrwanda.org (please send all documents in PDF format and indicate “Application- Field Intern to coordinate members’ relationships” in the email subject) by not later than 11/02/2019, 5pm local time. Only shortlisted candidates will be contacted for interview.